Prof. Fassa holds a degree in Philosophy (1981) and Law (1987) at Università Cattolica del Sacro Cuore, is a Supreme Court lawyer and professor in Gallarate. As an Italian Member of the European Parliament during the fourth legislative term (1994-1999), he was vice-chairman of the Committee on Development and Cooperation, member of the Joint Assembly of the Convention between the African, Caribbean and Pacific and the European Union (ACP-EU), head of Delegation in Mali (1995, 1997) and in Cote d'Ivoire (1997). 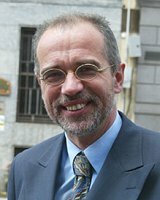 He was mayor of Varese from 1993 to 1997, then town councillor for culture in Gallarate (Varese, 2006-2008). He is author of numerous essays on political theory and law.